2002 is turning out to be a much better year. Right from the beginning, everything started going well, and has gotten even better. We had unusually good snow for Maryland (meaning it lasted for most of the day before melting). After Ben and Dana accidentally crushed their snowman with an oversized head, Allison and Dana built the perfect "snow lady" which lasted for several days (although Ben's hat was never quite the same). 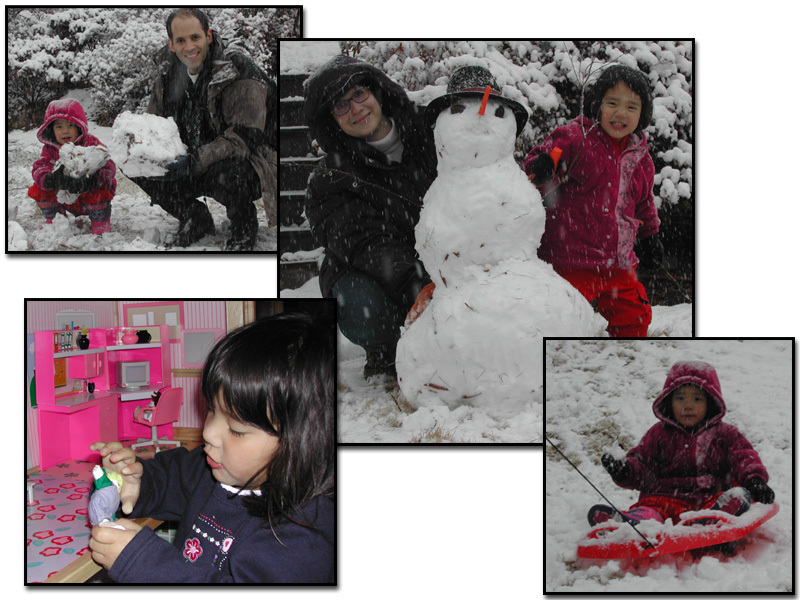 It was hard to keep Dana inside during the winter, but her new dollhouse helped. 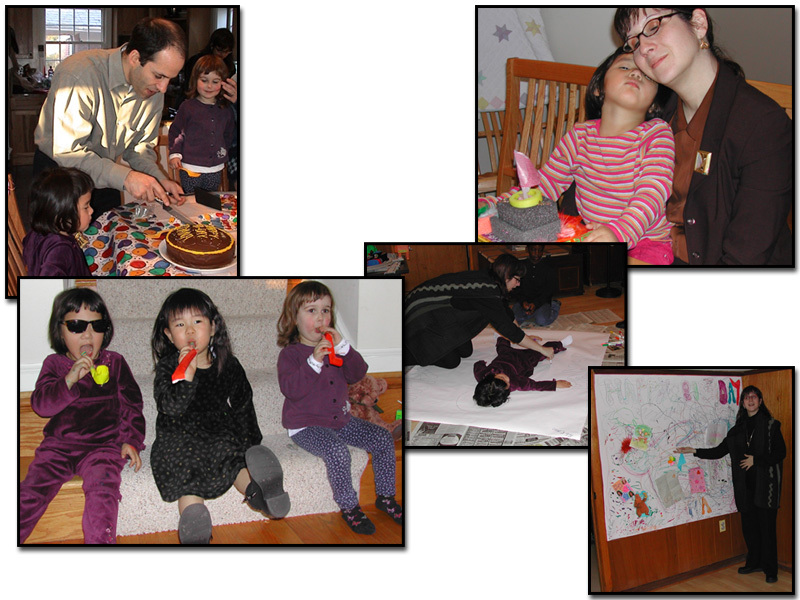 On February 8th, Dana turned three and had a wonderful party with some of her friends. Ben & Dana baked a cake, and Allison organized a huge art project. We traced Dana on a big piece of paper, and all of her friends colored it in - making a tremendous drawing now hanging on our basement wall. But perhaps the highlight of the party was the noisemakers which Dana demonstrated on the stairs with Momoka and Clio. Then Spring came and Ben and Dana were very happy about it. Dana could barely contain her excitement with her new found abilities. She continues to go to gymnastics and music class, and is very active. She got a "training-wheel bicycle" that she cruises around the neighborhood on. She climbs on everything in the park, and she loves to go hiking in a nearby forest. Ben is also very happy to be feeling completely back to normal - and doubly so since Dana is an eager partner in all outside activities. 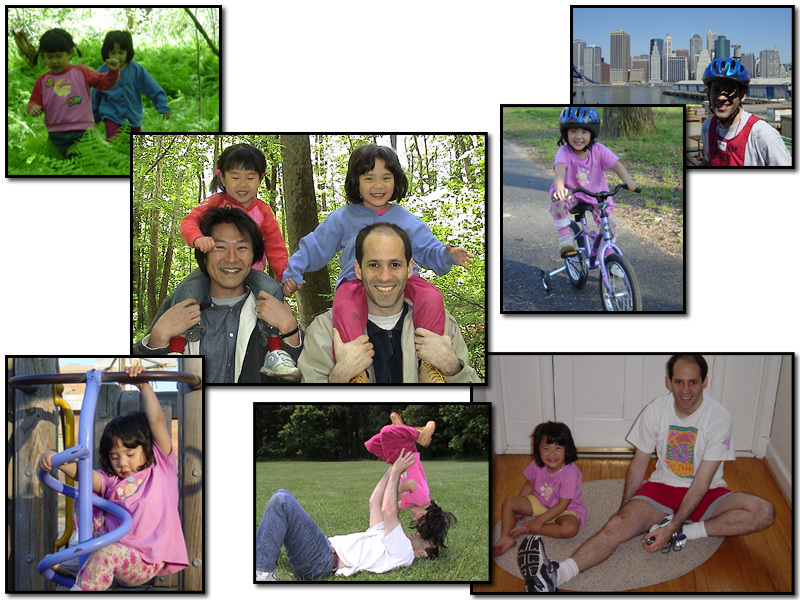 Throughout the year, Dana has become a remarkably mature little girl. 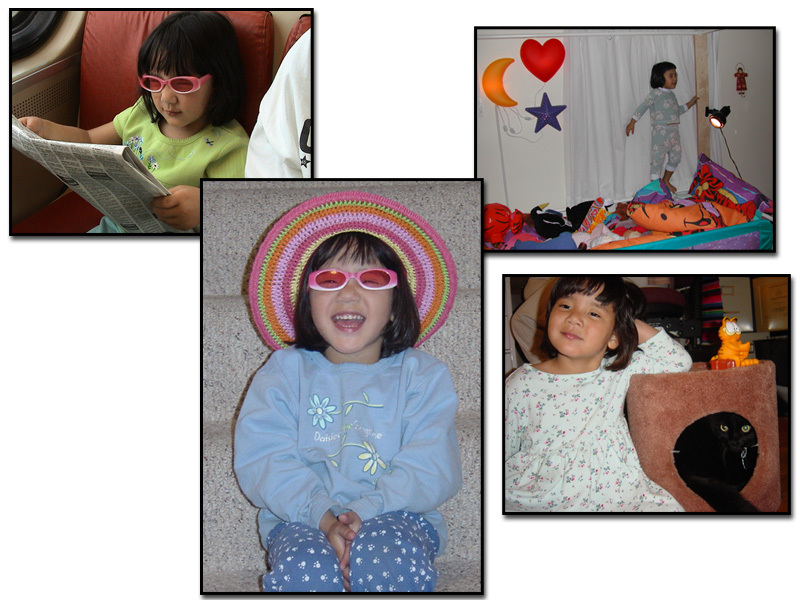 From her "big-girl bed" to her "travel sunglasses", she has poise beyond her years. On the train, she picked up a newspaper to read like the other commuters. And when she managed to get Pete the cat into his little house, she was very proud. 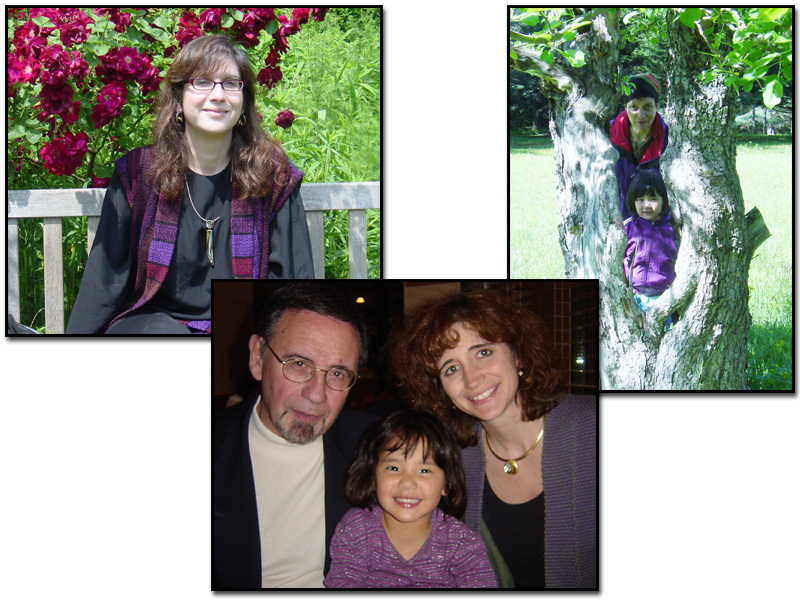 Of course, we went on our usual whirlwind of trips and spent lots of time visiting family. Dana played with Grandma Betty by a beautiful old tree in Windsor, MA. We had a nice dinner with "Aunt E." and "Poppy". And on a beautiful spring day, we enjoyed Mother's Day in DC where Allison found a nice bench by a beautiful rose bush. The last several months have been busy and crazy, but after last year, busy and crazy is a delightful normal.